Firstly, without a balanced diet which includes at least 5 vegetables per day, some fruit, some healthy fat, carbohydrates and protein, your base diet will be sub optimal which may impair adaptation to exercise. Without sufficient micronutrient quantities, your body is unable to respond to the best of its ability to any stress (energy or exercise). For this reason, in all consultations, Richie analyses diet accurately using specialist software to understand micronutrient content in the diet. When we exercise, we stress muscle fibres and stimulate a physiological process called muscle protein synthesis which essentially is the growth of new muscle leading to increased strength/endurance/(size). To increase this response, you must consume some protein after training at around 20-40g depending on your body mass, or in other words 1 – 2 chicken breasts. Timing isn’t a huge priority, as long as it’s within a couple of hours of training. It is also important to eat whole food sources as opposed to supplements with recent research showing this is a superior method to adapt due to nutrient availability. 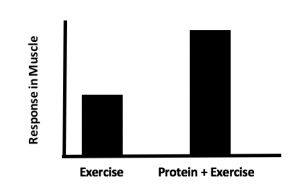 Carbohydrate after exercise has two purposes. The first is to replace used energy in the muscle and secondly to increase the response discussed above. To reap the rewards of the post exercise effect in the muscle, high glycaemic index (sugary) carbohydrates are best at this time. DO NOT TAKE THIS OUT OF CONTEXT! These types of carbohydrates should not be eaten all of the time, they lack fibre and spike the blood glucose response – a favourable process after exercise, but arguably not at other times during the day.Eat 20-60g depending on your body mass and intensity of session. E.g. Hard sessions with a lot of work should have ~60g (200g white rice) carbohydrate meal whereas a strength session with 20min of 1RM testing may only require ~20g (a banana). Creatine, along with caffeine, is one of the only proven supplements to work. It allows short term energy to be replaced quickly when exercising at high intensity. Essentially, allowing you to do a little more at any given intensity. 5g per day of creatine monohydrate is sufficient for this. There’s no real sweet spot for taking it, just when it is convenient for you. Cramp is the result of dehydration and loss of electrolytes. When you sweat, you lose electrolytes which are vital for muscle contraction. To prevent cramp, have electrolyte tablets at the ready for after the sweatier sessions, especially if you are prone to cramping. If you are caught short, salt water or Lucozade sport usually do the trick. Remember, you must replace sweat loss with water 1.5x the amount lost during exercise. Contact Richie now on 07772285902 for a free telephone consultation to find out how you can optimise nutrition for your training, lifestyle and health. New Year, New Me - Why Are New Year Diets Doomed to Fail? Protein - What, When and How Much? What is Gluten? Can You Benefit From a Gluten Free Diet? Red Wine - One to Include With Dinner? Bathroom Scale - Friend or Foe?